Glenn Hall has made a career in taking care of others. He has 30 years of health care experience and is now the executive director of Kosciusko Home care and Hospice. He also serves as pastor of Harvest Community Church. WARSAW — Glenn Hall has been the executive director of Kosciusko Home Care and Hospice for about a year in a half. When he was hired, he had the opportunity to work with the previous director for months before he retired. 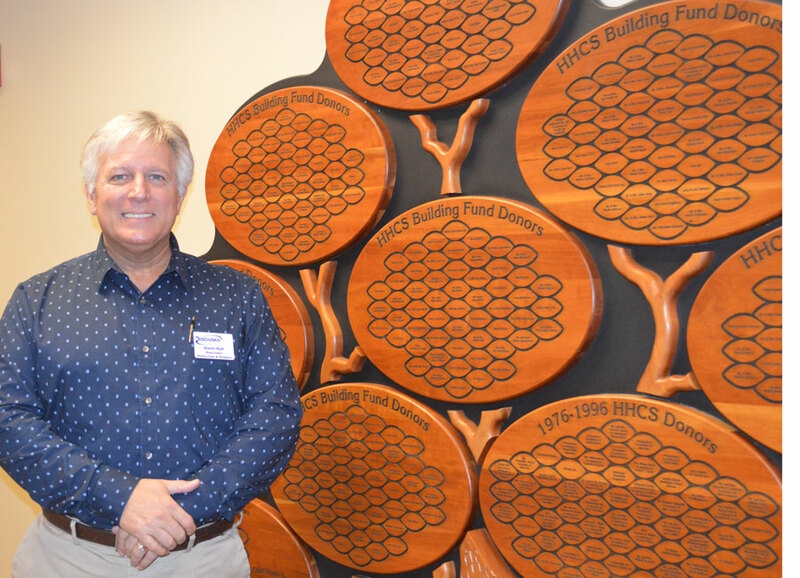 “To come back to a non-profit after being at Zimmer Biomet was a real change,” he said. In addition to his executive director duties, Hall is also pastor of Harvest Community Church in Pierceton. “Pastoring is my first love, but we’re a small church.” However, his job allows him to support the church as he needs. “It’s all about your passion and my passion is both,” he explained. Since becoming director of Kosciusko Home Care and Hospice, he has worked to have the agency be more visible in the community. One way he’s doing that is by serving as an ambassador for the Kosciusko Chamber of Commerce and letting people know the agency is there. While there are competitors, Hall explained Kosciusko Home Care and Hospice is the only non-profit provider of home care and hospice care in the county. “We can be anywhere in the county in 30 minutes,” he said. Hall wanted to stay in health care when his job was eliminated during the Zimmer-Biomet merger. After his job ended, he took time off, shortly afterward, his brother was diagnosed with cancer. Hall spent time caring for his brother, who made a complete recovery. Then a friend contacted him saying the executive director’s position was opening and asked if he could suggest Hall as a candidate for the position. “I had worked with hospice through my church work,” Hall said. He met with the board, had a phone interview and then an in-person interview. “And they made me an offer I couldn’t refuse,” he said. Hall said the agency’s board is very supportive and he’s been active recruiting two new board members. One of the new challenges he faced as the new executive director was reporting to a board because it was something he’d never done before. “The team here is amazing,” he said. “They do the work, I provide the guidance. My job is to make sure they have the tools and support they need.” He also wanted them to enjoy coming to work. Hall describes himself as a servant leader. “I’m not above doing anything I ask my staff to do,” he said. He allows the office some latitude with humor in the office and wants them to be able to cut loose a bit while they’re in the office. When he has some spare time, Hall enjoys singing and playing the piano and he’s a bit of a handy man. He has a workshop at home where he enjoys spending time doing projects. He and his wife have two grown children. His daughter and son-in-law live in Savannah, Ga., and have four children. His son and daughter-in-law live in Antwerp, Ohio, and have one child. He also enjoys spending time with his parents who are both alive and active. While at Zimmer, Hall had an opportunity to live and work outside of Kosciusko County. When he and his wife wanted to raise a family, they wanted to do it in Warsaw, close to family.